In this post, we are providing some techniques and ideas to secure you webpage login and registration page. Now a days security is more important to all of us as it protects website from unauthorized access. password_hash() creates a new password hash using a strong one-way hashing algorithm. Also password_hash() is compatible with crypt(). Therefore, password hashes created by crypt() can be used with password_hash(). NOTE : Currently we are using PASSWORD_BCRYPT algorithm to create the hash. Best part is that produces a standard crypt() compatible hash using the "$2y$" identifier. The result will always be a 60 character string, or FALSE on failure. It verifies that the given hash matches with given password. If the password and hash match found then it will return True, otherwise it will return False. After the complete registration process, you have users credential details in your database. Then next thing you have to perform is that Fetch password from the database and pass the password in password_hash() function using PASSWORD_BCRYPT encryption. Here we are comparing the entered password from html form with above hash key result ( e.g $hash ). 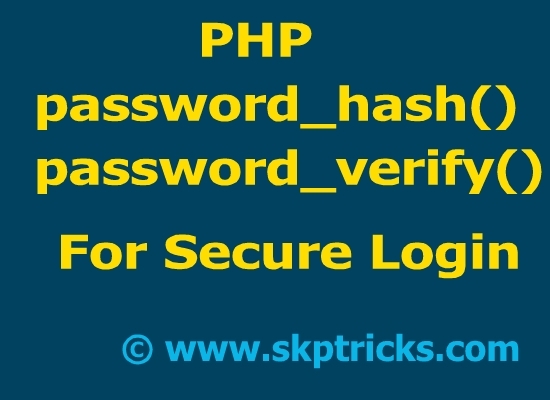 For the comparison purpose we are using pre-define PHP function password_verify(). Note : Incorporate login script using this method, This method helps you to secure the password field of html form. //Note that we also switched to BCRYPT, which will always be 60 characters. 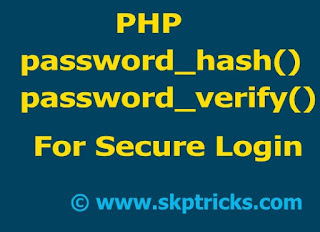 //verify the entered password with stored password present in database.